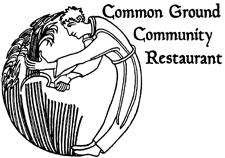 The Common Ground Cooperative is 34 years old and has played a pivotal role, like nothing else, in the socio-economic-cultural life of Brattleboro since its earliest days as a project of the old communes in Putney and Guilford. Many of the town's most beloved restaurants and purveyors of fine foods were spun out of the CG: TJ Buckley's, Peter Havens, Amy's Bakery, Katy's Deli, and the Brattleboro Food Coop itself, all have their roots in The Common Ground. Almost anyone who has lived in or around Brattleboro for a few decades has stories to tell about great food and good times they had at the CG. It's surprising how many people you meet who actually worked there. They usually tell you something like, "It was my first job, and it totally changed my life." Since its inception, The Common Ground has been a healthy whole-foods restaurant, but it has been more than that. It has been the true and preferred meeting place for the people of Brattleboro, and an incubator of our town's creativity. Many musicians recall playing some of their most memorable dates there. The annual Free Thanksgiving Meal began there. And, perhaps most important, it has exemplified the progressive principles of a true workers' cooperative. The Common Ground is owned by no one but the people who work there to make it happen. And that is very special. In the last three or four years, The Common Ground had fallen on hard times, stopped serving food (other than free food for the needy and indigent), and mainly presented extreme music shows that could be heard nowhere else, much of it appealing to youth culture. Presently, with a new board of some of Brattleboro's finest citizens, the CG is preparing to reopen in 2006 as a place that will feel like home to people of all ages and backgrounds in our town, not to speak of wide-eyed tourists. It will definitely happen! There are also plans afoot to produce a coffee table book about the CG, and various other kinds of cool memorabilia.